Several development tools targeting the design of reactive programs (typically, for critical embedded systems) are made available by the synchronous team of the Verimag laboratory. Lesar can formally verify (model-check) temporal program properties written in Lustre. There are 4 different tools suites containing Verimag Synchronous tools. docker: based on a docker image. It requires docker. V6 via opam: integrated in the opam (ocaml) package manager. It requires opam. (*) "V4 essentials" is a sub-set of "V4 full", containing the V4 tools that are really useful to use the V6 tool-set (luciole, gnuplot-rif, sim2chro, etc.). open XQuartz -> Preferences from the menu bar. Go to the last tab, Security, and enable both "Allow connections from network clients" and "Authenticate connections" checkboxes and restart XQuartz. The first time it will download the verimag-sync-tools docker image on the docker hub. Then you will be logged onto a docker machine where all tools are available from the path. to open an interactive session. to remain into your CLI context. Putting this script somewhere accessible from your PATH migth be convenient too. The Lustre V4 tool set is described in the Lustre V4 Documentation. You need to go via the docker or the opam way. One way to install the V6 distribution is via opam, a package manager for ocaml programs. It should work out of the box with most Linux distributions and OSX (mac). It ougth to work on windows too (follow this link for instructions). In order to obtain the very last version, one can add the verimag opam repo. opam repo add verimag-sync-repo "http://www-verimag.imag.fr/DIST-TOOLS/SYNCHRONE/opam-repository"
The Lustre V6 language is described in the Lustre V6 Reference Manual. Here we focus on tools. The Lustre V6 compiler is named lv6. By default, lv6 produces lic code out of a .lus file (hence its name). lic stands for "Lustre Internal Code". Basically, lic is Lustre V6 with all genericity and syntactic suggar removed. If one wants to generate only the code necessary for a specific node, one has to use the -node option (or -n for short). The call to lv6 edge.lus -node edge -2c not only generates C files: it also generetes a edge.sh script that can be used to generate a edge.exec binary file. The edge.exec file can be generated directly via the -cc (--compile-generated-c) option. It is also possible to use the interpreter that is embedded in lv6 via the -exec option. requires the V4 tool set installation. can be used with all tools that follow the RIF conventions (luciole-rif -h for more information). And then you should be able to use the V4 tools set: lus2ec, ecexe, ec2c, ecverif, etc. Here again, the focus is on the basic use of tools, not on the language. More information can be found in this Lutin Tutorial. RIF stands for Reactive Input Format. It is the format used between the V4 and the V6 distributions tools to read inputs and write outputs. If you simulate a Lustre (V4 or V6), a Lutin program, or if you use lurette or rdbg, all tools will produce .rif files which follows the RIF conventions. RIF Data files, that can be visualised with sim2chro or gnuplot-rif. A RIF file is a sequence of data values separated by spaces, newlines, horizontal tabulations, carriage returns, line feed and form feeds. A data value can be either an integer, a floating-point or a Boolean (t, T, or 1 stands for true ; f, F or 0 stands for false). Single line comments are introduced by the two character # and terminated by a new line. Multi-line comments are introduced by the two characters #, and terminated by the two characters #@. Pragmas are special kinds of comments, that migth (or not) be taken into account by tools that reads RIF data. One-line pragmas have the form #pragma_ident, and multi-line pragmas the form #pragma_ident ... #@. #step <int>, to indicate that a new step is starting, and that the following data correspond to input variables. #program "lurette chronogram (degradable-sensors.lut) "
It is possible to hide the display of some variables, using command-line options, or using the .gnuplot-rif resource file. Try luciole-rif -h more information. 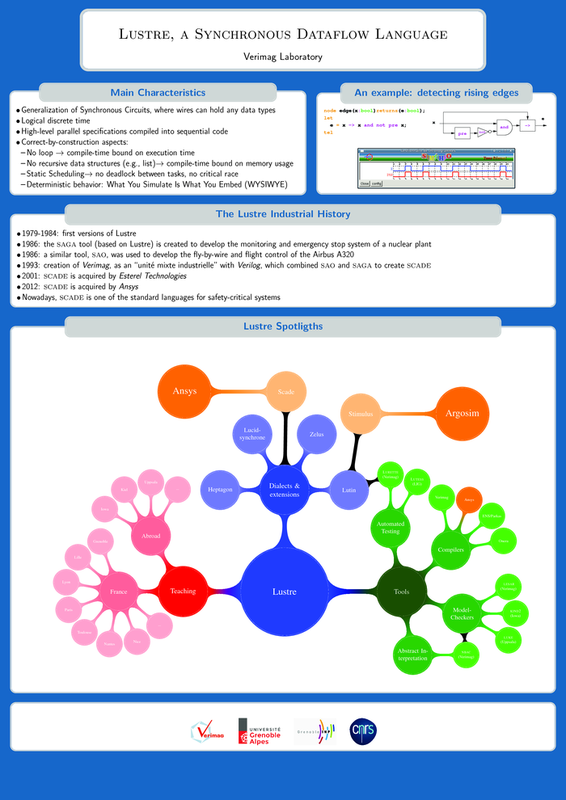 luciole-rif is a wrapper around luciole, which is part of V4 tool set distribution. Note that several sut/env/oracle can be used. Any system call that follows the RIF conventions can be used as arguments of -sut, -env, and -oracle. lurette is actually (now) an alias for rdbg -lurette ; more information can therefore be obtained via rdbg -h.
rdbg -sut "lv6 f.lus -n a_node"
rdbg -sut "lv6 f.lus -n a_node" -env "lutin env.lut -n an_env"
rdbg -sut "lv6 f.lus -n a_node" -env-nd "lutin env.lut -n an_env"
-oracle "lv6 f.lus -n some_prop"
Lesar is a model-checker of temporal program properties written in Lustre. It is distributed with the V4 tool set (it is also part of the V6 pre-compiled distribution and the docker image). In order to model-check Lustre V6 programs properties, one first needs to translate it into ec or Lustre V4. lesar actually uses the V4 compiler under the hood to generate an .ec file, which is given to ecverif, which performs the real work. More information on Lesar is available Here.